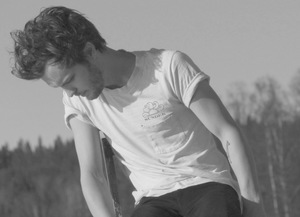 After three full-lengths and two EPs as The Tallest Man on Earth, Swedish singer-songwriter Kristian Matsson has become a king in indie-folk. His precise finger picking and intricate fretwork are anchored by a full-throated, almost caustic voice, which managed to fill the enormity of Hackney Empire last night, giving it an intimacy often hard to achieve and bringing out hipsters from across the city. The evening opened with Matsson’s wife, Amanda Bergman, aka Idiot Wind, humbly sitting at the piano with a set of her as-yet-unreleased music (have no fear, her debut album should be out later this year!). With a tender, raspy voice — a milder version of Regina Spektor or Brandi Carlile — she beautifully set the mood for the evening. During the break, nothing much changed on stage. After all, Matsson really only needs a mic and a guitar. From out of the darkness, he stumbled into the light, sending the relatively calm audience into an uproar of cheering. Out came his guitar and he was off. His set was a mix of new and old, all with a familiar tone. Sometimes it was hard to differentiate between the two, with many cuts from his latest release, There’s No Leaving Now, sounding like an extension of an older melody. But that’s also his appeal. His tunes evoke a sense of familiarity that could easily lull you to sleep or bring you to tears. Known for his charisma and stage presence, he’d frequently slip in front of the microphone to eye individuals in the audience during breaks from singing. At one point he tried amusingly to provoke the media taking photos, but they didn’t seem to notice, which warmed the audience to his madness. For a man who wasn’t “trying to be funny,” as he put it, he continually sent giggles throughout the crowd with his cheeky smiles and sly remarks. Aware of his own quirkiness, saying at one point ‘This is only going to get weirder,” Matsson went back and forth between crumpling into his guitar, which at times flowed so effortlessly from him that it seemed like another appendage, to stooping, bird-like on one leg. He did make use of the one chair, at points sitting down for the ‘harder’ bits, only to get back up within seconds. Matsson's sound was almost exactly like his recordings, except with a new gravity and weight added to some of his standards like Love is All, The Gardener, A Lion’s Heart, I Won’t Be Found and crowd favorite, King of Spain. Twice we were treated to a piano accompaniment, the most moving with There’s No Leaving Now, his new record's title track. The ending of the evening saw another treat, as Bergman came out to harmonise part of Thrown Right At Me from his EP, "Sometimes The Blues Is Just A Passing Bird". The two lovebirds sang so closely that at moments it seemed only the mic was preventing a kiss. Their gentle-nature and perfectly complemented voices were gone just as quickly as they came, leaving us all wanting more.